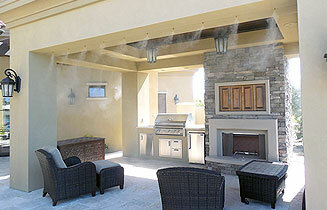 If you are a home owner where the temperature makes it unbearable to use your outdoor living space or a contractor building or remodeling a home, having a personalized custom misting system installed on or around your patio by one of our factory trained technicians can cool your outdoor living space up to 30 degrees. 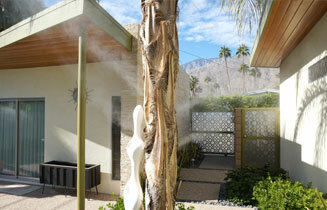 Our custom misting systems can also be attached to any retractable awning. The awning can be all the way out or in as desired and the mist system can stay on while the awning is moving to the desired position to enhance your outdoor living space. 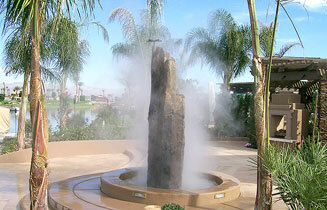 Custom Mist can also create dramatic effects by installing misting and fogging effects around trees, plants, rocks and even around fire features to transform your landscape into a unique and mystical experience. If you're looking to cool your pool off or to "WOW" your guests, our misting and fogging features can be incorporated in any pool, fountain, waterfall or any water feature to transform your landscape into a cool and soothing tropical showcase. The portable misting tower is a great addition to your backyard while you're barbecuing, playing in your yard, laying out or relaxing by the pool. All of our portable misting towers are made of stainless steel and come with an in-line shut off valve on the tower. Portable misting towers can be installed or added to any existing misting system and can be painted or powder-coated any color. If you are a contractor or home owner building or remodeling a home, a flush mounted misting system is highly recommended if you don't want to see the atomization line inside or around the perimeter of the patio. Our technicians will install an aluminum fry molding while the house or business is still in the framing stage, then once the stucco is applied we install the atomization line inside the fry molding and cover it up with a custom fitted and drilled galvanized track cover so only the nozzle tips extrude through the track for a true custom misting system. 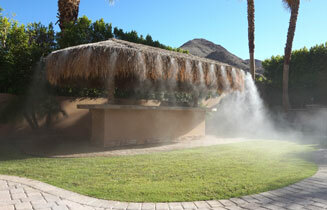 At Custom Mist we can incorporate our misting systems into any palapa. Our factory trained technicians install our (welded) stainless steel atomization line around the outer edge of the palapa hidden under the palm-frons and install custom built copper extensions to extrude through so you only see the nozzle tips for a true custom designed and installed misting system. At Custom Mist our systems allow businesses to maximize valuable seating capacity and to draw passerby's in. 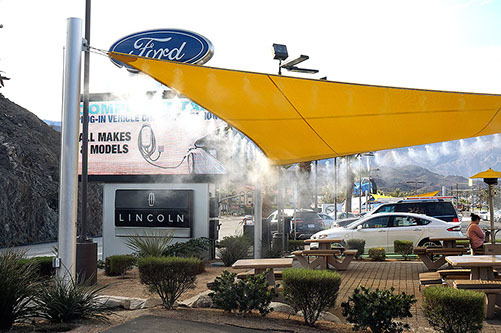 Treat your customers with a cool and refreshing atmosphere by having a personalized custom misting system installed by our factory trained technicians that will help your business maintain and even lengthen peak periods of business for maximum table turn-over for any restaurant, hotel, resort, walkway, lounge, or any outdoor seating area. 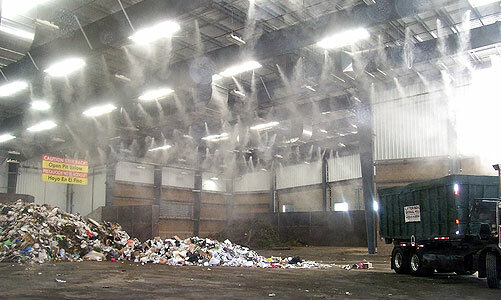 Installing a misting system at waste transfer stations, bulk solid processing facilities, construction sites, excavation sites and recycling facilities will suppress dust from exiting the facility to a minimum, clean the air, protect your employees and help against the risk of heat stress. By installing a chemical injector we can also keep odors to a minimum from leaving the target area. All industrial environments where dust is present can be extremely dangerous to your health and can have cancer-causing agents. Protect your business from getting costly environmental fines and citations. Helps to lower the temperature by 35 degrees. Helps lower the threat of mortality. 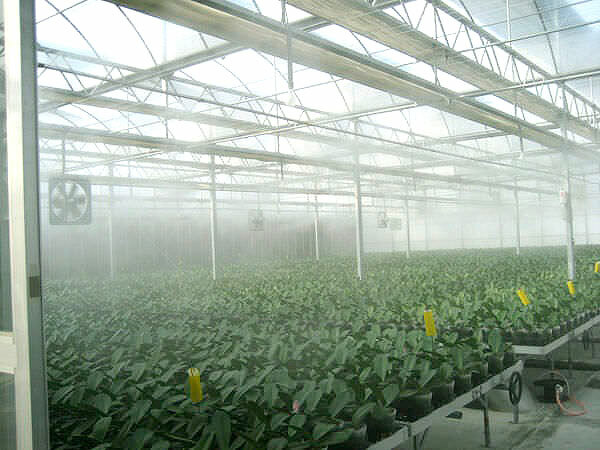 Misting systems in greenhouses will create the perfect growing environment by being able to control the temperature and humidity levels all year round to create the perfect micro climate for plants. The advantages of being able to control the temperature and humidity levels will reduce product spoilage, help reduce venting during warmer periods and increase product production. Children are more sensitive to the dangers of heat stress and exhaustion. 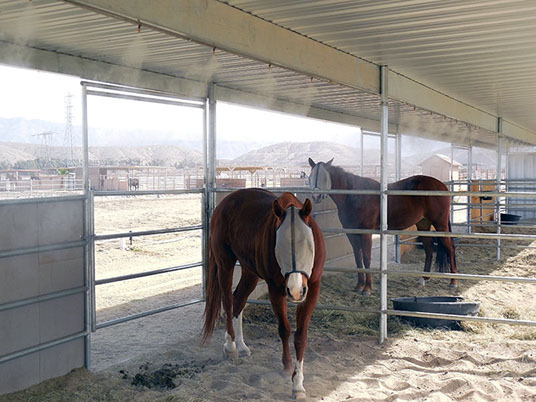 Custom Mist can provide comfortable locations where students can seek relief from the heat while they're outside playing, on break or eating lunch. 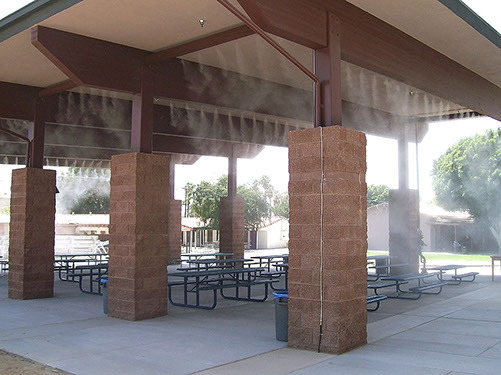 Installing misting fans, misting towers or a misting system at any school or daycare provides a climate-controlled environment for kids and students to thrive in. 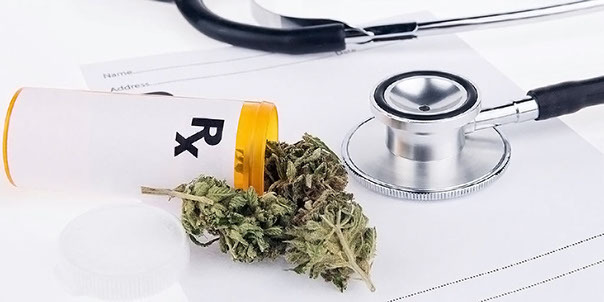 With the recent developments surrounding medical marijuana, there is a growing need for misting systems to help resolve some of the challenges and issues associated with large scale cannabis propagation. Although the needs vary from facility to facility they include effective odor control, humidification for flowering, curing and drying rooms, disinfecting and sterilization of maturing flowering plants. In all these cases, A Custom Mist high pressure misting system is ideal to address and solve all these issues. 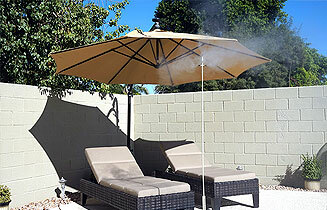 At Custom Mist we can install our misting systems on any fabric shade structure to cool off anyone sitting under it. Our installation department starts off by installing our (welded) stainless steel atomization line around the perimeter of the structure by using steel wire (not zip ties) so none of the fabric will get damaged and when there is high wind the misting system will float around with the structure and not rip the fabric. © Copyright Custom Mist Inc. All rights reserved.